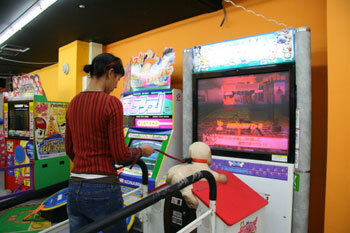 Back on 1 May 2007 Tokyomango blogged a virtual dog walking arcade game in Japan. You walk on a treadmill while holding the leash of a fake dog (looks a bit like one of the pony’s you used to ride a the supermarket). You walk in front of a video screen like those those sometimes used in front of exercise bikes in the gym where you see the countryside go by as you pedal. But in this case, you may encounter problems along the way with your dog, other dogs, cars, etc. Its an interesting twist on how far virtual life is taken at times. hey this is kandace and i do not like dogs or cats but i love monkey;s they are very playful animals i also like dolphins too.